The King brown snake or Mulga snake (Pseudechis australis) is a highly venomous snake found over most of mainland Australia, except for the extreme south and the southeast coastal regions. This species has also been reported in southeastern Irian Jaya and probably also in western Papua New Guinea, but it's believed that this population could, in fact, be a totally different species. They are considered Australia’s most widespread venomous snake, occurring in most states including the Northern Territory, most of Western Australia, Queensland, New South Wales, and South Australia. 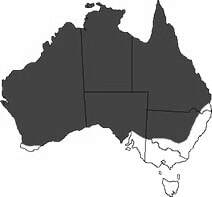 They are absent from Victoria and Tasmania Island. Reportedly they are declining or have disappeared from some coastal areas of Queensland. These highly adaptable snakes are found in almost any type of Australian environment except for rainforests or in very humid or cold climates. King brown snakes inhabit Mulga woodlands, dry open forests, open woodlands, chenopod shrubland, heath, hummock grassland, savannah and almost bare sandy or gibber deserts. King Brown snakes may be active both during the day or night depending on weather conditions. They usually shelter in burrows, deep soil cracks, logs, rock piles, and timber or rubbish piles when living near humans. The King Brown snake is a large and robust snake with a wide head and a smooth snout, usually they are considered the heaviest venomous snake species found in Australia. The typical length of an average adult snake is about 1.5 m (4.9 ft) but large specimens are known to reach 2.5 to 3.0 m (8.2 to 9.8 feet) in length. Females are usually smaller than males and their size also varies with location, generally, the largest specimens are found in the northern parts of their range. They are among the longest venomous snakes in the world, exceeded only by the world's longest venomous snake the King Cobra (Ophiophagus hannah), the South American Bushmaster (Lachesis muta) and some African mambas. In Australia, the King browns are surpassed in length only by the Coastal Taipan (Oxyuranus scutellatus). Like many other Australian venomous snakes their color is variable depending on the location within their range. In the hot desert, they usually display a lighter coloration while in the cooler regions of South Australia they become darker. Their coloration ranges from a light brown to a dark reddish or coppery brown, grey, dark green, to almost black. Each scale has a lighter area and a darker area giving them a subtle reticulated pattern. Despite one of its common names being King brown snake, these aren't "true" brown snakes which belong to the Pseudonaja genus like the Eastern Brown (Pseudonaja textilis). In fact, they belong to the genus Pseudechis, that of the black snakes. This common name comes from their typical brownish coloration. While the species common name, Mulga snake, derives from the fact that they are found in mulga woodlands, although these adaptable snakes aren't restricted to this particular type of habitat. The species is also known by other common names including orange-bellied brown snake or yellow-bellied brown snake. There aren't any subspecies recognized but some recent studies suggest the existence of 4 new and smaller species found in northern Australia and New Guinea. The King brown snake was first described in 1842 by John Edward Gray, who placed it in the genus Naja the same of deadly cobras like the Indian Cobra (Naja naja). They are considered to be Australia’s most widespread venomous snake species. Although they have been responsible for human deaths, their bite isn't usually fatal to humans. This is due to the fact that their venom although highly toxic is less potent than the venom of taipan snakes, tiger snakes, or the common brown snake. The LD50 value in mice is "only" around 2.38 mg/kg subcutaneous. But in order to compensate for lower venom toxicity, they inject large amounts of it by hanging on and chew on the victim when they bite. ​They have 2 grooved fangs in the front of its mouth from which the venom flows. It's believed to be the species that causes the most number of venomous snake bites in Australia. By comparison on average milking, a tiger snake produces around 10 to 40 mg of venom while a king brown snake may inject up to 150 mg of venom in a single bite. They have the largest recorded venom output of any snake species. If threatened or harassed, the king brown snake usually flattens its neck, spreading it into a hooded shape, nest it raises its body into an S shape and if necessary it will strike very rapidly. Normally venomous snakes will only attack or bite humans if disturbed or threatened, but King brown snakes have bitten people who were asleep at the time of the bite. ​Their venom is mostly haemotoxic breaking down blood cells and damaging muscles, and only mildly neurotoxic occasionally causing ptosis, drooping of the upper eyelids. A King Brown snake bite causes hemorrhaging, muscle weakness, vomiting, nausea, abdominal pain, diarrhea, lightheadedness and headaches, mild paralysis. and kidney damage or even renal failure. Despite their common name they do in fact belong to the black snake genus Pseudechis, therefore should antivenom be required Black snake antivenin is used to treat their bites. In case of a suspected bite from a King brown urgent medical attention is required. In the wild, King Brown snakes feed on a wide variety of prey such as birds and small mammals, frogs and reptiles including lizards and other snakes even of their own species. Specialized in eating other reptiles such as lizards and other snakes including Australia's most venomous snakes, they are apparently immune to the venom of the Western Brown Snake (Pseudonaja nuchalis). They also show no effects when bitten by another king brown. Occasionally they will also eat reptile eggs or bird eggs, invertebrates including venomous spiders and even carrion. They have been affected by the introduced and toxic Cane Toad, since they aren't immune to it, which is thought to have led to the species decline in the northern regions of its range. The mating season takes place in early to mid-spring when males engage in ritualized combats, entwining their bodies while keeping their heads raised attempting to push over their opponent to win. Usually, females lay from 4 to 20 eggs per clutch averaging around 9 eggs, normally the eggs are laid in an unused animal burrow or beneath a rock or log. The clutch size is related to the female's size, the larger the female more eggs it lays. Depending on their incubation temperature the eggs may take between 2 to 3 months to hatch. The hatchlings measure around 25 cm and must care for themselves from birth. The king brown snake has not yet been classified on the IUCN Red List of Threatened species. Currently, there aren't any conservation measures in place for these snakes. However, the introduced Cane toad is believed to have caused some declines for these type of snakes in the northern regions of their range. Found in South America green anacondas are considered the largest snake in the world.